We offer “mini” franchises to people who want to start their own Tuneless Choirs. We make this as inexpensive as possible, as we want there to be as many Tuneless Choirs as possible – they make the world a better place! Packages starting at £250 per year plus 15% of sales. 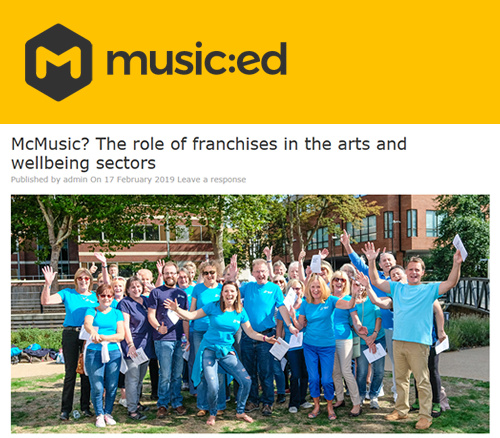 A Tuneless Choir franchise allows you to tap into our expertise and use our name and branding. You get support from us at “TLC HQ” and the network of other choirs. Your choir can attend our fabulous national events, like the one featured in the video below. They can order from our range of clothing and other merchandise, with t-shirts and polo-shirts customised to your choir. Choir Leaders. Musical people who want to encourage everyone to sing (even the tuneless) because they have a passion for the benefits it brings. Exceptional people (with more time) take on the marketing, communication, admin and finance of the choir themselves, others pay a Choir Manager to do so or get a package offering a greater level of support from Tuneless Choir HQ. Choir Managers. People with great organisational skills who wants to start Tuneless Choir(s) as a hobby or business venture. They will pay a Choir Leader (approved by TLC HQ) to run each choir session, and are likely to need less support from Tuneless Choir HQ. Choir managers are often tuneless themselves, so understand the need for a Tuneless Choir. Fill out the form below and we’ll send you a Franchise Prospectus.